The khyung are hybrid Tibetan creatures, akin to the Hindu bird-man deity Garuda (see cat. 7, 13). In this small silver tokcha, a khyung clamps snakes in its beak and holds their bodies in his small hands, raised in front of the outstretched wings. In contrast to Garuda, the khyung have hands rather than claws. Here the hands are emphasized by the bracelets at the wrists and the fleshy forearms. The midriff is difficult to understand; there is a loop of a necklace from collarbone to waist, with a loop at waist level. The torso is in recess but the pectoral muscles are in relief. The plump stomach and thigh are anthropomorphic, but at the knee the body type transforms to purely avian legs and stylized claws. Between the claws, there are two vertical lines which perhaps were part of a former pedestal, now lost. The head of the bird is not the typical Garuda face with a marked beak, for instead the Tibetan khyung have two horns, just visible above the small oval ears. The bird with horns is a curiosity of Tibetan mythology which reflects genuine zoological observation as well as the influence of Nepalese Garuda mythology. The Nepalese Garuda devours snakes and is a protector deity in Buddhism, with bird wings, bird or human head, a human body torso, and claws. The Tibetans represent their protective bird deity differently, with horns on the head. Its appearance is thus related to indigenous birds of prey like the vulture or horned eagle; in fact, it is the feathers called aigrettes growing from the head which look like horns, especially when the bird is observed in flight from the ground . The attribute of horns also relates to very ancient Tibetan myths about the ancestors of their divine kings, who are sometimes said to have horns, perhaps inspired by the Sasanian crown types which were known from coins circulating in Tibet as amulets, through trade connections during the period of Tibetan empire in Central Asia . 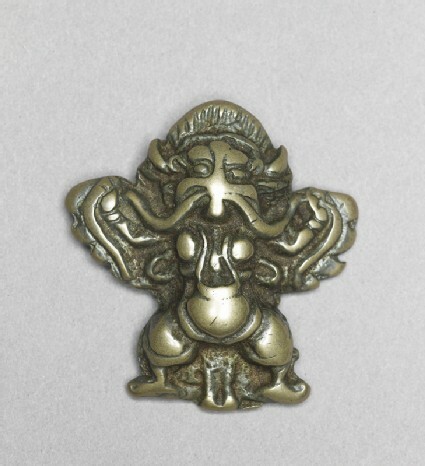 This tokcha is solid cast in a silver alloy, with two vertically aligned prongs on the reverse which would have let two separate cords pass to hold it in place. It may have been meant to be sewn on a garment. The lower edge now appears to be irregular and was possibly once wider at the base. At present, its original function remains uncertain, as does a precise dating or regional provenance. 1 See T. Anninos' discussion of the Tibetan khyung eagle deity and horned bird amulets, in his 'Tokches: Images of Change in Early Buddhist Art', figs. 4, 7 (the present tokcha appears as fig. 1). 2 On this mythology of the horned kings, see Martin, The emergence of Bon and the Tibetan Polemical Tradition, pp. 118-37; see also the Sasanian silver coins recovered in archeological excavations in northwest Tibet (modern Qinghai province), illus. Heller, 'The Silver Jug of the Lhasa Jokhang', fig. 12: coin of reign of Peroz, 459-85 ad, silver mint, recovered in Wulan county, Qinghai Archeological Institute acc. no. 2000 wTDJ:8.